National Games Village has taken a lead in creating a sustainable zero waste community. Tungabhadra block in the games village have been actively involved in managing the waste their homes generate within their complex for the past three months. 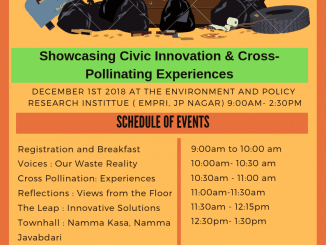 It all started with inspiration from Vellore Srinivasan, who has 16 years of experience in implementing Zero Waste Management (ZWM) Projects and the non-profit group AID India coming forward to fund the initial cost of implementing ZWM in NGV. With tremendous support from residents, volunteers and the association, they kickstarted something that today can proudly be a shining example of their commitment and perseverance. This model showcases the basic principles of ZWM, creating wealth from waste, creating employment to the needy and documenting all these activities, processes and best practices for future guidance and replication. The first month they generated 4347 kgs of waste out of which only 418 kgs went to the municipal collection, the rest was managed in their own backyard.There was no looking back.. It is now 90 days of collection,segregation and sale of recyclables, compost and Panchagavya from 220 families that generated a sales proceed of Rs 31,117. Mayor Sharadamma visited them along with 15 BBMP officials. The Karnataka State Pollution Control Board Chairman appreciated their effort when he visited them. Zero Waste is a goal that is ethical, economical, efficient and visionary, gets people to change their lifestyles and practices to emulate sustainable natural cycles, where all discarded materials are designed to become resources for others to use. Reducing waste helps save valuable resources and decrease disposal at our landdumps, ensuring a better quality of life. NGV are champions that care for Mother Earth and have done their bit…what about you?? ?